All of us at Sachiyo Ito and Company/Dancejapan wish you peace, good health and joy in the New Year! In 2018, thanks to your enduring support, we were able to complete our mile stone, the 20th Year Season of Salon Series, the on-going series of performances and lecture demonstrations on the performing arts of Japan. With world class guest artists and speakers, the program has artistically and intellectually educated and inspired NY audiences. Under the theme of the future generation of traditional performing arts”, three programs of Salon Series were presented and enjoyed by our supporting audiences: Japanese Dance and Experimental Workshop and Forum for the Very Young; Traditional Japanese Dance and Theater in Contemporary Performing Arts; Expression in Traditional and Contemporary Japanese Dance; and enjoyed by our supporting audiences. Salon Series #66: The Sun, or the Moon? on October 21, 2019. 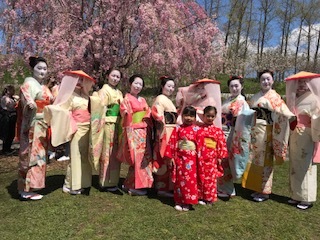 Our charity services such as Free Japanese Dance Workshop for Children at libraries and schools, and Free Japanese Dance Performance at geriatric centers throughout the boroughs of the City of New York will continue to contribute to the diverse communities of New York City. As an NPO, our mission is to continue to serve our community of New York. Your tax-deductible donations will be greatly appreciated and will help us meet our mission and achieve our aspirations. Donations may be made through the secure PayPal link on our website. Again, wishing you a wonderful New Year! “It was both a privilege and a great joy to attend your magnificent performance today.